History: Two pre-Columbian Indian friends, Turok and Andar, were out on a hunting expedition when they accidentally found their way into a large valley surrounded by huge, unclimbable cliffs They discovered that dinosaurs still survived in the valley and that they could not find the way back out. For many years they survived in the valley, battling the dinosaurs, cavemen and other bizarre threats. Comments: Got his own book, Turok, Son of Stone dated March-May 1956. It changed publishers to Gold Key around #30, and eventually ended with #130. Valiant relaunched it as Turok, Dinosaur Hunter in June 1993. In the Valiant version, the hidden valley proved not to be somewhere in North America, but was instead located in an alien dimension, known as the Lost Land. 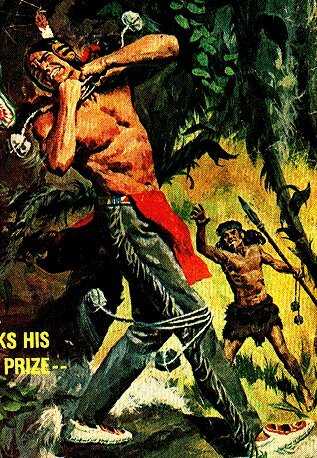 Turok was a man out of his time - born before the White Man conquered America. With a deadly combination of modern weaponry and ancient wisdom, he fought a vendetta against creatures birthed by an unholy union of nature and technology - the bionisaurs.